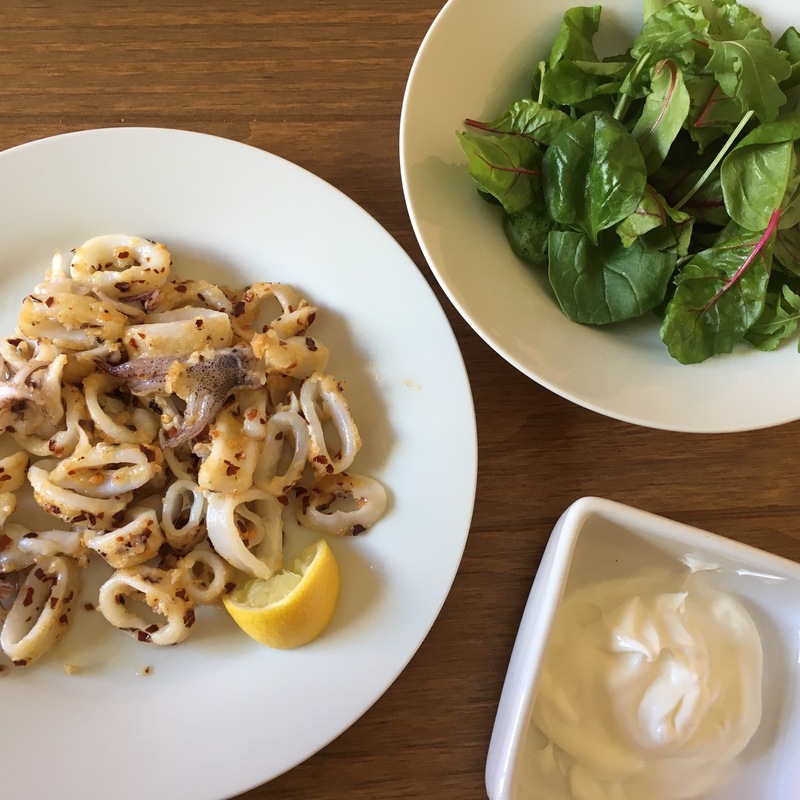 Decided to treat myself, and make me some calamari! As the world knows, it was a big day in Britain, and I was involved in the count in my local area. This being after working during the day, to which I then went to work with an hours sleep this morning! Needless to say, my energy has been lacking! Annoyingly, I went on the hunt aliohli, to which I could find none. I then tried to find a good recipe to make my own. I will be totally honest, due to my lowers energy levels. I did cheat. I bought premade Mayo, and altered it to suit. Adding in garlic etc to taste. In a bowl, siv enough flour to lightly coat the squid rings, adding a pinch of salt and pepper. Meanwhile heat up a frying pan which a drop of butter, and olive to help stop the butter from burning. Add chilli flakes as per preference, and fry until aromatic. Add squid, fry for 2 minutes, giving the squid a good stir after 1 minute. Serve with a drizzle of lemon, a rocket, spinach and water cress salad and a good helping of garlic mayo. Think in all, it probably set me back like £2 something, as I had the Mayo, flour, lemons etc. Already. Squid was about £1.60 which I thought was pretty good.